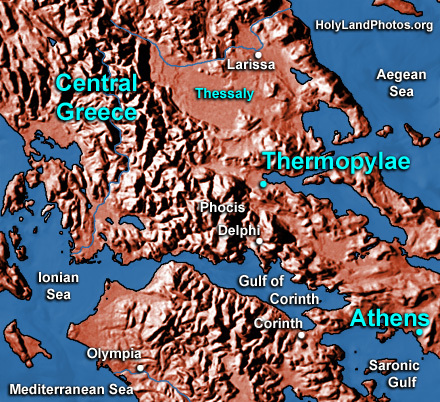 Thermopylae is located 85 mi. [135 km.] northwest of Athens. In ancient times it guarded a narrow, sea level, “pass” between mountains on the southwest and the sea on the northeast. Its name means “hot gateway” and hot springs still exist in the area. There in 480 B.C., 300 Spartans and 700 Thespians (temporarily) held off about 300,000 invading Persians led by Xerxes. The stalled Persians eventually sent a force of men around Leonidas’ forces, through the mountains to the west of the pass thus encircling the Spartans from in front and behind in the pass. The Spartans fought valiantly, but eventually all, save two, were killed in battle. The Persians continued their advance on Athens and burned the city. But in pursuit of the Athenians, by land and by sea, they were defeated that year off the island of Salamis. Their final defeat came the next year at the battle of Plataea and the (short) era of peace that followed ushered in the classical period of Greek history. Actually, because of its strategic location a number of battles have been fought at Thermopylae, but the above was the “signature” event.